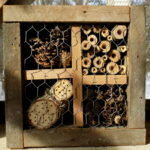 Convert pieces of our old Nature Center cedar siding with other natural and salvaged elements into your own Reclaimed Bug Hotel. Learn why native insects are a must for any healthy yard ecosystem. Reclaimed Pollinator Hotel Build is part of our Heckrodt Wetland Reserve's Pollinator Initiative. Each hotel will come with some live (dormant) Mason Bee pupae. Together, we can all make a meaningful difference for many of our native pollinators. Please bring a hammer to assist in construction.